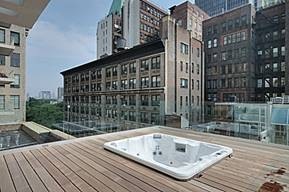 Located in the very heart of New York City, Tribeca Townhomes have been designed to combine contemporary urban design with environmental sustainability and eco-friendly living. Paying homage to Lower Manhattan’s industrial past, the 6 one-, two- and three-bedroom properties are completed and have been constructed using traditional design elements such as limestone and architectural iron design. The building has been developed by A2 Investment Group, a husband and wife led company with 20 years experience in New York and Philadelphia. Andrew Hawkins, Associate- Head of International at Chesterton, says,”The Big Apple has long been an attractive holiday destination for Brits. As well as being a business hub, the bustling nightlife, great sights fantastic shopping and huge range of restaurants makes it a great place to visit. The construction process has been carried out as sustainably as possible with most materials sourced locally and demolition and construction materials recycled or reused whenever feasible. Building materials and paints have been specifically chosen to reduce the emission of harmful, noxious gasses. Marrying historic Tribeca with contemporary urban life, the new glass and steel facade provides residents with sun-filled homes. Solar panels on the roof provide supplemental hot water to each apartment, reducing energy use and lowering costs. The installation of energy efficient air heating and cooling system also reduces the need for excess temperature control. Emergency exit stairs are fitted with motion sensitive lights for reduced electricity consumption. The entire development employs a zero-waste programme with energy-star rated appliances in every apartment. A programme is in place for the recycling of non-biological waste, including tins, bottles and paper. Sustainable transport within the city is encouraged and a bicycle storage unit is provided. The development is within half a block of ten subway lines, giving residents many options for travel within the city. Properties for sale include five duplex apartments and one penthouse. Freehold prices range from £752,807 (US$1,342,000) to £4,280,175 (US$7,628,000).